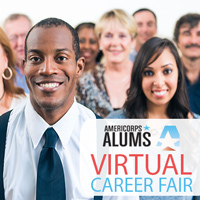 Did you miss our June Virtual Career Fair, sponsored by Teach For America? 24 employers from the education, corporate, nonprofit, government, and healthcare sectors attended our fair and still have hundreds of open roles that might be a fit for you. Each employer came to our fair looking for talented alums who have the skill and experience to pursue impact careers. Check out the full list below and click over to their hiring page! Plus, remember to register at www.AmeriCorpsAlums.org to take advantage of our Jobs Board and other professional development resources like our monthly webinars, future virtual career fairs, resources on going to graduate school, and more, all via our monthly career newsletter! ← Toot Your Horn for the AmeriCorps Class of 2015! I clicked a link to one of the above organizations. It just takes you to the general hr section, nothing special. You’re dumped in the same pool as everyone else. Should be a dedicated section, followed from this page.